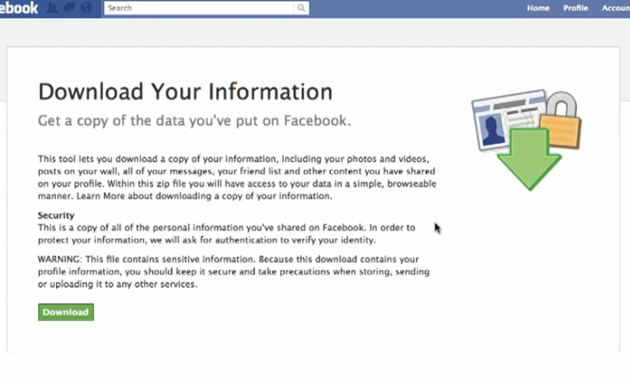 Facebook Now Allows You To "Download Your Information"
Whoah. Until now there hasn’t been a way to download info off of Facebook, but at today’s Facebook event in Palo Alto, Facebook CEO Mark Zuckerberg announced a feature that allows users to port their data from Facebook in a .zip file, “People own and have control over all info they put into Facebook and “Download Your Information” enables people to take stuff with them,” says Zuckerberg. “Download Your Information” is groundbreaking as the premise behind the Diaspora Project is that it is the “open” portable Facebook. As of today it seems like Facebook is the “open” portable Facebook, as the company now feels secure enough to let users leave with info intact. Facebook Product Manager David Recordon explains that you can access the “Download Your Information” feature from your account settings, hit the download button (see above) and Facebook will allow you to download everything off your profile, including your friends list, events, all of your messages, wall posts and all of your photos into a zip file. Recordon emphasizes that the product will be simple enough for laymen to use, a one click process. “Download Your Information” should be rolling out to all users beginning today.